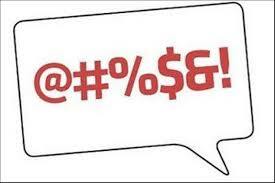 When Can/Should Journalists Allow Swear Words in Stories? If a word needs to be bleeped, no part of it should be heard. We don’t try to give listeners a hint by including a bit of the word’s start or end. – The “NPR Policy On Use Of Potentially Offensive Language” is posted here. – A discussion of NPR’s guidelines on the subject is here. – The rules apply to foreign languages as well. Here’s what other organizations say about this issue. When it comes to broadcasting, the Federal Communications Commission has set up guidelines that vary according to time of day and the nature of the words. Are they used in a sexual way or are they part of bona fide journalism? It is a violation of federal law to air obscene programming at any time or indecent programming or profane language from 6 a.m. to 10 p.m. Congress has given the FCC the responsibility for administratively enforcing these laws. The FCC may revoke a station license, impose a monetary forfeiture or issue a warning if a station airs obscene, indecent or profane material. An average person, applying contemporary community standards, must find that the material, as a whole, appeals to the prurient interest. The material must depict or describe, in a patently offensive way, sexual conduct specifically defined by applicable law. The FCC has defined broadcast indecency as “language or material that, in context, depicts or describes, in terms patently offensive as measured by contemporary community standards for the broadcast medium, sexual or excretory organs or activities.” Indecent programming contains patently offensive sexual or excretory material that does not rise to the level of obscenity. The courts hold that indecent material is protected by the First Amendment and cannot be banned entirely. FCC rules prohibit indecent speech on broadcast radio and television between 6 a.m. and 10 p.m., when there is reasonable risk that children may be in the audience. The FCC defines profanity as “including language so grossly offensive to members of the public who actually hear it as to amount to a nuisance.” Like indecency, profane speech is prohibited on broadcast radio and television between the hours of 6 a.m. and 10 p.m.
Information regarding the details of what was actually said or depicted during the broadcast. Sufficient detail must be provided regarding the words or language used, or the images or scenes depicted during the broadcast, and the context of those words, language, images or scenes. The date and time of the broadcast. Indecent or profane speech broadcast between the hours of 10 p.m. and 6 a.m. is not actionable. The call sign, channel, frequency and location of the station involved. The name of the program, DJ, personality, song or film, or network are also helpful. This information will help us to quickly and efficiently process your complaint. The FCC does not require tapes or transcripts in support of complaints, but such materials may be helpful and should be provided if available. Any documentation you provide to the FCC about your complaint becomes part of the FCC’s records and may not be returned.